When you're washing your car, you want to clean the wheels and ties first. This is because of the grim on your tires from tar and debris on the road. When splashed on your car from spraying your tires, you'll have to re-clean if you don't start with your wheels first. 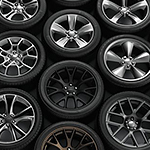 Secondly, you should pick the right cleaner for your wheels, especially if you have anodized or coated wheels. You should always clean your tires in sets, choosing the back set and then the front set. You don't want the cleaner to dry on your tires before you can wash it off. You'll need a strong hose to rinse off your tire before you move on to the next one. In addition, you can use a wheel detailing tower cloth or microfiber towel to dry your tires once finished. Want to get the supreme clean? Come in for a checkup and wash at Subaru of Spokane.